What is the present perfect continuous? 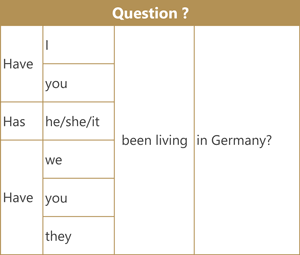 The present perfect continuous (or present perfect progressive) is one of the English verb tenses. It describes situations (single or repeated) that started in the past and still continue to the present (and possibly into the future). I've been living in Munich for two years. I've been training at the gym recently. The present perfect continuous focuses more on the unfinished action itself. The present perfect simple focuses more on the completion or the present result than the action itself. It can also describe temporary actions that were finished recently (a short time ago) and have present results. 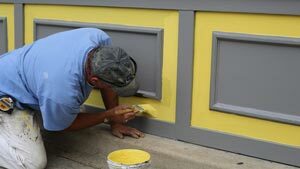 Yes, I've been painting the house. How do you write and pronounce the present perfect simple? 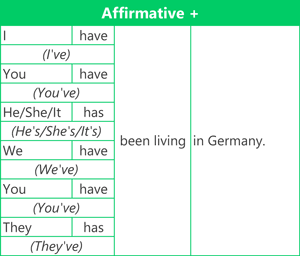 Use the auxiliary verb 'have' (have/has) + been + main verb (-ing). Yes, you have. / No, you haven't. How long have you been living in Germany? For 2 years. We commonly use contractions (e.g. 'I've been meeting friends' or 'He hasn't been working today') for the present perfect continuous tense, especially when speaking English. [live] I've been living in Germany. [save] I've been saving money for a new car. [see] He's been seeing his friends. [stop] I've been stopping work early recently. [develop] They've been developing a new idea at the company. [travel] I've been travelling with friends. [lie] She's been lying to the teacher. [panic] He's been panicking about the exam. Here are time markers that can be used with the present perfect continuous. This gives a period of time. I've been working at this company for two years. This gives a starting point. I've been living in this apartment since 2015. These expressions can be used for periods of time that are not finished. He's been studying hard this week. This started not long ago. We've been going to the gym recently. 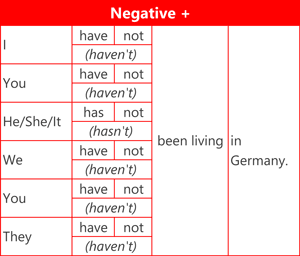 Type the verbs in the present perfect continuous tense and use the affirmative, negative or question form. (Have) you (been swimming)[swim] this month? Yes, we (have). My sister (has been eating, 's been eating)[eat] more fruit and vegetables too. We (haven't been watching, 've not been watching, have not been watching)[watch] television every evening. (Has) your dad (been drinking)[drink] less beer? Yes, he (has). My mum (has been taking, 's been taking)[take] dancing lessons for four weeks. I (haven't been smoking, 've not been smoking, have not been smoking)[smoke] since January. 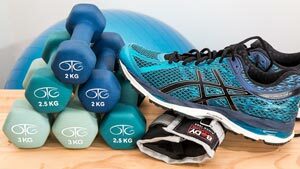 (Have) you (been going)[go] to the gym? Yes, I (have). My sister ('s been cycling, has been cycling)[cycle] to university since last week. Our parents (haven't been ordering, have not been ordering)[order] fast food this month. (Have) you been (missing)[miss] food like chocolate and pizza? Yes, we (have)!